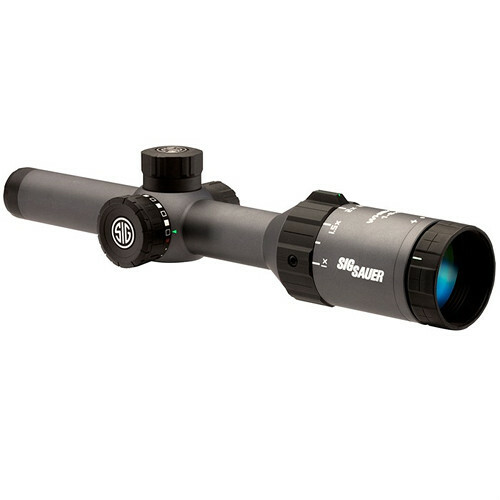 Sig Sauer outfitted its 1-5x20 WHISKEY5 Riflescope with high-quality optics and the QuadPlex reticle. The HDX optics feature High-Definition (HD), High-Transmission (HT), and Extra-Low Dispersion glass, which provides true color, and maximizes resolution and brightness. Coated with SpectraCoat anti-reflection coatings, the lenses exhibit high transmission across the entire visible spectrum, delivering bright and crisp images. To ensure that image quality is not degraded by the environmental conditions and elements, the optics are protected from abrasions and scratches by the LensArmor coatings. Additionally, the oleophobic LensShield coatings help whisk away oil, water, and debris. Another highlight of this riflescope is its QuadPlex reticle, which is located in the 2nd focal plane and features four medium posts with a fine crosshair. To endure most outdoor conditions, the lightweight and durable housing's 1" maintube is made from a single piece of aluminum and provides a waterproof and fogproof performance. The windage and elevation knobs are knurled for slip-free operation and offer 110 MOA windage and 120 MOA elevation adjustment ranges with 1/2 MOA increments. Also available with this riflescope is the Sig Ballistic Turret Dial (SBT), which features a precision tactical finger-operated knob. The Sig Ballistic Turret (SBT) is a custom laser-etched elevation dial that uses your bullet specifications, ballistic coefficient, muzzle velocity, elevation, and other environmental factors for the correct bullet drop compensation and pinpoint accuracy. All other dials and rings are also enhanced with knurling for a slip-free grip.